Evidence suggests that dinosaurs had good colour vision, studies of brain cases can provide an indication of the volume of the brain and analysis of the preserved holes in the skull that carried the nerves back and forth can suggest which senses were important. For example, with Tyrannosaurus rex the orbits in the skull (eye sockets) were large compared proportionately with other reptiles, birds and mammals. Some scientists have postulated that the big Tyrannosaurs had the largest eyes of any land animal. The optic nerve of T. rex has been estimated to be more than 2 cm in diameter, indicating that a lot of information was being passed from the eyes to the brain. Crocodiles and birds have colour vision, indeed some birds, most notably the raptors have exceptional eyesight – hence the phrase “eyes like a hawk”. Recent discoveries have shown that many dinosaurs may have been brightly coloured, so colours of plumage and scales may have been very important to the Dinosauria. A recent paper, published on behalf of a group of British and Chinese scientists even suggested that some small, Theropod dinosaurs were ginger coloured. With the theory that dinosaurs had good colour vision; model makers and manufacturers can go to town with the colours and patterns they put onto their various dinosaur replicas and toys. Just like animals today, many dinosaurs would have been camouflaged or patterned in a particular way, natural selection favouring those creatures that were best adapted to their environments. Other dinosaurs may have used colour to communicate with other members of their species or to threaten or intimidate predators and prey. An example, of a novel use of colour can be seen in the new scale model of the fearsome meat-eater Giganotosaurus by Bullyland of Germany. This hand-painted 1:30 scale model is painted a mixture of dark green and mustard on the tail, the back and the flanks, but the head and the throat has been depicted in a contrasting, bright red pigment. This is a large model, of a large carnivorous dinosaur. Indeed, based on the fossil evidence, Giganotosaurus may be one of the largest meat-eating dinosaurs of all time. Fossils excavated from Patagonia in Argentina (remarkably 70% of an adult skeleton is known), indicate that these animals may have reached lengths in excess of 50 feet. The bright red head is very striking when compared to the rest of the body and at first glance this looks like an unusual choice of colouration for a model of an apex predator, especially when considered in context with other data known about Giganotosaurus. Studies have shown that the ratio of the thigh bone to the lower leg bones indicate that this dinosaur was not a particularly fast runner. It probably specialised in hunting the large long-necked, slow moving Titanosaurs. But why the red head? There has been a lot of controversy over whether large Theropod dinosaurs were hunters or mainly scavengers. The American palaeontologist John “Jack” Horner has championed the hypothesis that these large creatures were primarily scavengers. 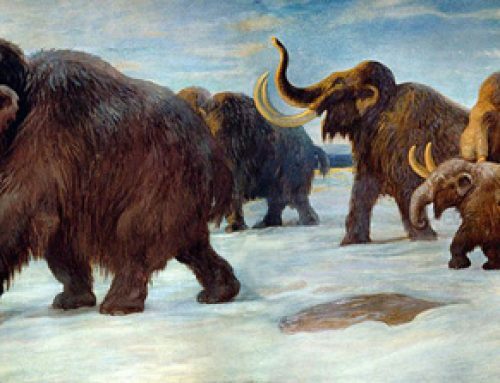 The hunter versus scavenger debate continues today, with advocates citing evidence from both extinct and extant creatures to support their point of view. In all likelihood, a large carnivore such as T. rex or Giganotosaurus would not turn down the opportunity of a free meal if it came across a carcase. So it is quite likely that these animals were opportunist scavengers to some extent. Those predators that could chase off other carnivores and steal their kills would have a distinct advantage. This behaviour is seen in Africa today, with, for example hyenas chasing off lions and robbing them of their hunting spoils. A big Theropod, with a strikingly marked head appearing on the scene could intimidate other predators and scare them away from their meal. Hence the reason for the bright markings on the head of the Giganotosaurus model. Smaller Allosaurs confronted with a large 40 foot plus predator roaring, and flashing its large teeth in its huge jaws with some vigorous head bobbing would have probably been enough to see off even the most determined and hungry dinosaur.